Chiang Mai is one of the most popular destinations in the world to visit for its beautiful mountain ranges and elaborate Buddhist temples scattered throughout the city. Locals celebrate many holidays throughout the year and gather around at large festivals in each season. When you’re exploring the local area, there are a few popular festivals to visit during your stay. People in Chiang Mai like to look their best on these occasions. Consider stopping by Heavenly Nails for some luscious eyelash extensions before heading over to watch the festivities. Known as the festival of light, the Loi Krathong Festival is when the locals wash their sins down the river and ask for forgiveness before releasing hundreds of glowing paper lanterns. The beauty of the lights in the dark sky is majestic and is a popular event to photograph for tourists. The event takes place during a full moon on the 12th of the month in November near the water in various locations throughout Thailand. The festival is when Thais are known to release their troubles from the past year and make new wishes for the future. The Yi Peng festival is an annual event that is hosted on the 12th lunar month of the year and is often celebrated in November. Brightly lit lanterns are released into the sky and are also a part of the Loi Krathong Festival. The locals believe that the rivers are filled to their fullest when there’s a full moon. You’ll likely see many of the houses in the local area decorated with flags and colorful hanging lanterns during the event. Many Buddhists in the area also believe that your wish will come true once you let go of the lantern. Many attendees can enjoy buying food from local vendors, watching fireworks, and taking photos. The most popular place to attend the festival is at Mae Jo University. Songkran is traditionally celebrated on April 13th or 14th and is considered to be a water fight when the locals play with plastic water canons during the day. The moat area in the city is the best place to visit if you want to get drenched and have fun, which is located near many of the city’s bars. In some parts of the town, the party continues throughout the week and is one of the busiest times of the year in Chiang Mai. Each year, the Flower Festival is hosted from February 2th to the 4th and is considered to be the top flower show in the destination. Attendees can see a parade of floats that are decorated with bright flowers and see different types of exotic plants. A beauty pageant is one of the highlights of the parade as visitors sit in lawn chairs and watch the festivities. Once the parade ends, attendees can get the chance to have a closer look at the floats and landscape projects after they’re put on display at Suan Buak Haad. The Nimmanhemin Arts and Crafts Fair is held during the first week of December and is free to attend. Guests can enjoy listening to live music at the stage, participating in craft workshops, and ordering food from local vendors. Guests are encouraged to arrive early to secure space before shopping for ceramics, clothing items, soft furnishings, fabric, and artwork that is made by local artists. It’s a great place to immerse yourself in the culture in Thailand and purchase a few souvenirs to take home. 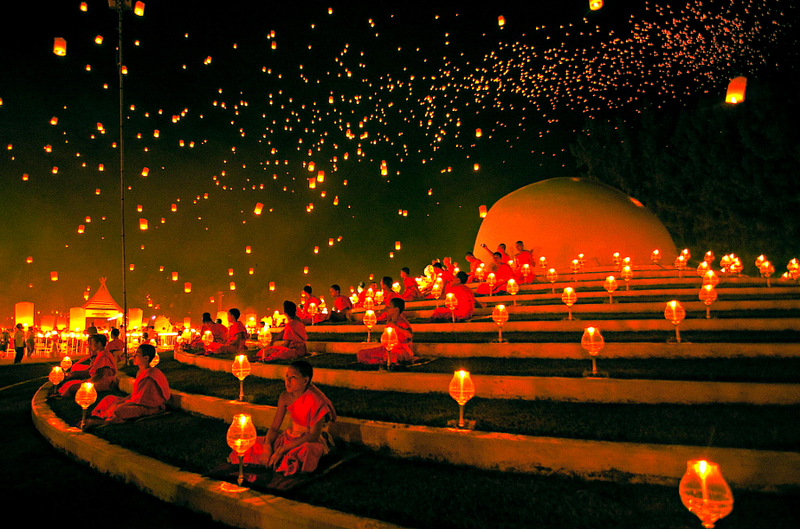 Visakha Bucha Day is hosted on May 29th and celebrates Buddha’s birth 2,500 years ago on the Visakha full moon. The event commemorates three different holidays during Buddha’s life when he was born, reached his enlightenment, and died 45 years later. The public holiday is when most Thais visit their local temple and alcohol is not allowed to be sold. As a tourist, you can experience Visakha Bucha Day by visiting a temple at the top of Doi Suthep. Free food and water are often available for those who hike to the top to Wat Phrathat Doi Suthep. Many people offer their flowers to Buddha before lighting incense and a candle. Some Thai followers also choose to stay overnight before seeing the sunrise in the morning.